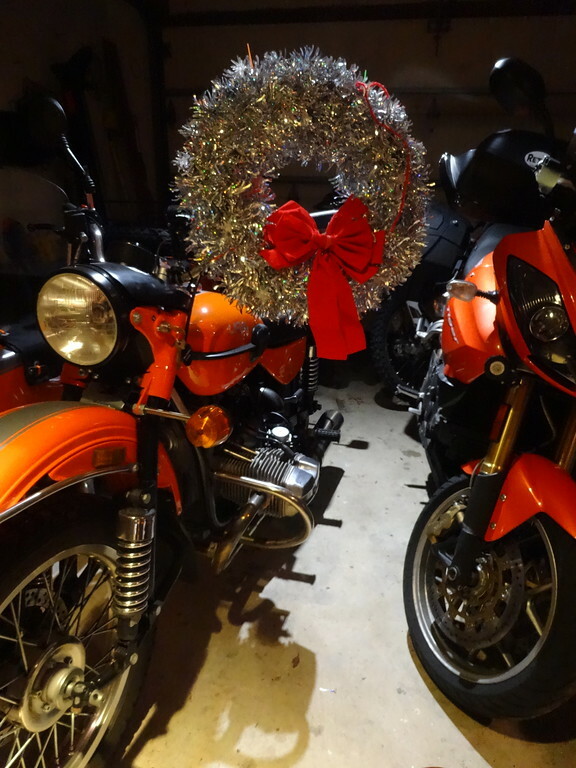 Tomorrow when December comes knocking I’ll be putting the Ural’s Christmas wreath back on the luggage rack. 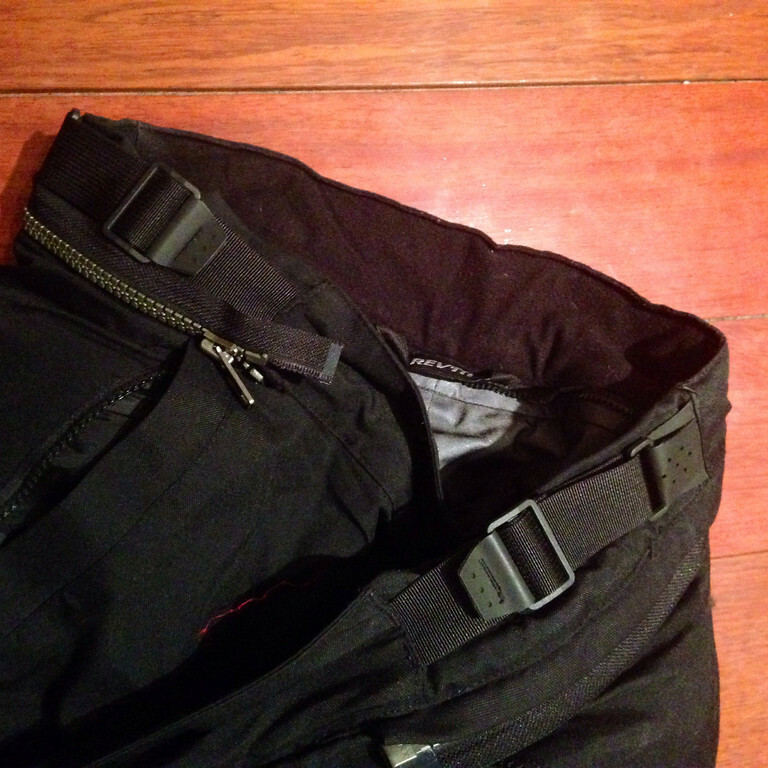 I just can’t bring myself to do it before then. If I remember correctly, I bought the mylar wreath at Target. It’s pretty weather proof. I also got a set of battery powered lights for a couple o’ bucks and strung them through it, so it also lights up for extra festive-ness. The ole knobby tire wreath will be coming out of the attic tomorrow, too. It’s officially be the holiday season! The day we set aside for giving thanks is just a few short hours away. 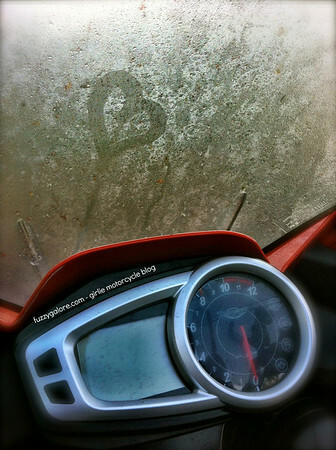 And so I want to give thanks for motorcycles, for you, for the love that comes my way each and every day. It really is fascinating how the words of someone on the other side of the country or maybe the world affect you. Even if you’ve never met, you formulate some idea of who that person is. After all these years the idea that someone takes the time out of their busy day to leave a comment on a blog, thumb-up a photo or chit-chat via Twitter still makes me feel like a million bucks. Thank you for all your snark and your wisdom. Thank you for reading. Wishing you lots of love, laughter and a boatload of pie on Thanksgiving Day. If you’re riding, ride safe. The Universe is amazing. All of those stars, planets people, animals, atoms… mind boggling. Are we all entangled? When we move are the vibrations of our lives and actions felt by others? Is being in the same unlikely place at the same time as someone you know chalked up to coincidence? Or do you think the Universe is at work, moving you into position like some giant chess game? During the Void Rally 8, over 12 hours after starting the rally two states away, with no prior knowledge of each other’s routes I entered the highway in Annapolis, Maryland just as Catfish was passing that very entrance ramp. Now, you could argue that we had similar thought processes when we planned our routes. But as it turned out, we didn’t visit the same exact same bonus locations up to that point. Then when you factor in stopping for gas, stopping to use the restroom, traffic lights, wrong turns, etc. – that we would cross paths at that moment was pretty amazing. Not only that, but I didn’t see any other rally riders all day. The one other rally rider I did happen to see… was a friend. He’s been on vacation and had been out dirt riding. What are the chances we’d be in the exact same place at the same time? This island has almost 8 million people on it. You could say that we might be inclined to be on the same road at some point because this is where we live and there are only so many major artery roadways. But to pull up right next to one another? The odds are pretty slim, I think. But I supposed the chances of seeing him this afternoon were just as good as they were back in June when I happened to pull up behind him on the highway. Neither of us knew where there other was at that moment. 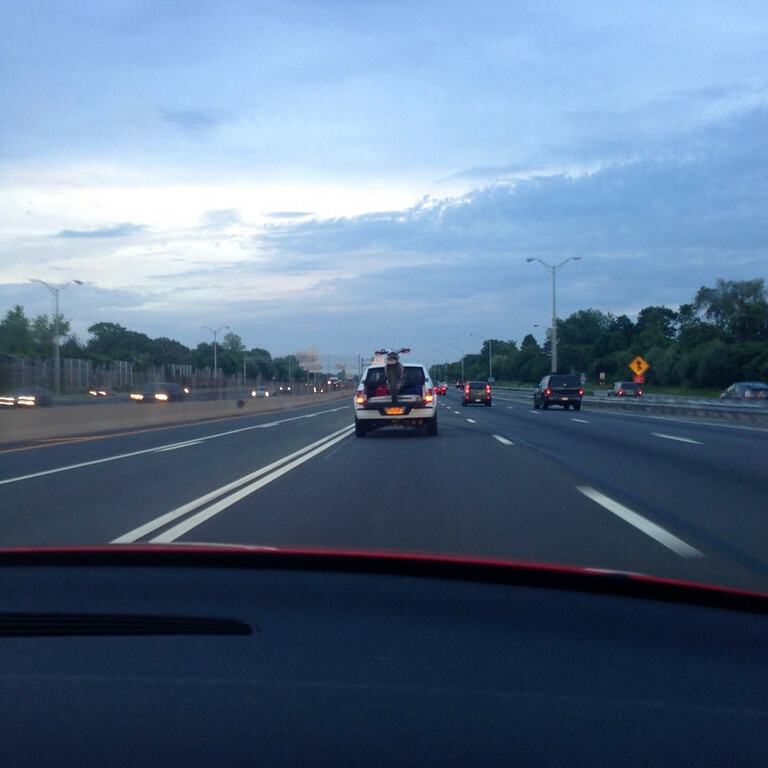 He was coming back from a trip to PA and I was coming back from upstate New York . We were about 60 miles from home. 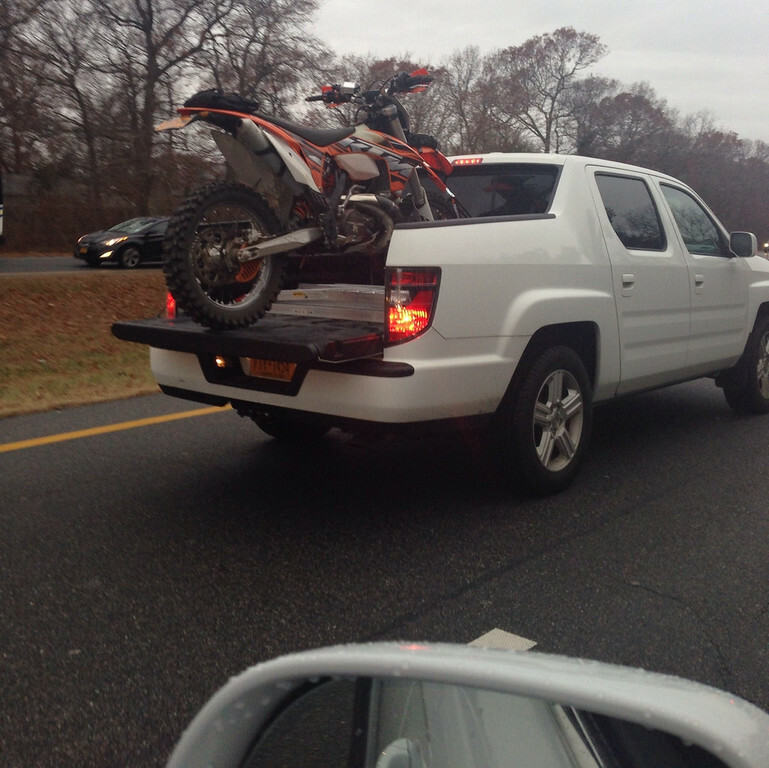 I’m beginning to think that maybe he just drives around with this KTM in the back of his truck all the time and is following me – the long way ’round.